Some excerpts of 20 seconds. CATHEDRAL MUSIC CHAPELS were commissioned by the council of Trent (1545-1563) in order to disseminate the evangelical message among common people by means of attractive compositions. To combat Lutherans and other 16th century religious reformers, Trent not only centralized the ecclesiastical administration, but it also unified the liturgy, thus making it the same everywhere. Moreover, the only language to be used was Latin, already a dead tongue by then. Consequently, the Catholic cult became very abstract and difficult to understand for illiterate people. Music was to help overcome this obstacle. On the other hand, the council strengthened the power of the hierarchy and increased the restrictions on access to it so that the church became powerful, dominated by the clergy, hierarchical and distrustful of manifestations of popular devotion. Thus, within this polarized society the role of religious music was to act as one of the bridges that would take the evangelical message, guarded by the hierarchy, to ignorant and illiterate people who all too often were still convinced of the existence of witches. But, in order to act as the bridge by which this message was to be transmitted, the music had to be of high quality and the excellence of its interpretation such that it was able to arouse pious feelings among the faithful, which would encourage them to improve their personal lives. This was the aim of baroque music, bearing in mind also that the congregation did not participate in the singing, as their role in worship was passive. THE MUSICAL ORATORY: this was created by Saint Felipe Neri (Florence 1515-Rome 1595). Shortly after the Council of Trent he began to bring together a few followers in Rome every evening in small churches - oratories - in order to pray, listen to sermons and sing pious hymns. Certain musicians quickly took up the idea and began to disseminate it first in Rome, from where it passed on to Naples and later spread to the important European cities to arrive in Barcelona in 1700 more or less. This new musical form, a mixture of prayer and spectacle, competed with the opera, but no stage representation was used, only voices and instruments. Yet it had recitatives, arias and choruses etc like the opera. From Barcelona this new musical form spread throughout Catalonia during the second half of the 18th century parallel to the growth of the new Catalan commercial middle class, its natural audience. Out of more than 400 librettos that we know of, 384 still remain. The present edition is the first interpretation of a Catalan oratory from the 18th century. In Girona the oratory was introduced by Manuel Gonima, chapel master from 1735 to 1774, who was born in Lleida in 1710 and died in Girona in 1792. His incorporation in Girona cathedral caused a serious conflict among the canonry and their beneficiaries. They complained that Gonima, without belonging to the clergy, acceded to the cathedral dressed as such. He also received the honararium reserved exclusively for the clergy. The conflict lasted for several months and Gonima finally became a priest, but not until eight years later. 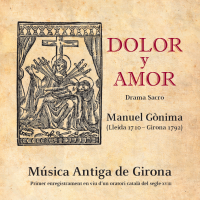 The chapter archives of Girona conserve 72 of his scores, all of them written for voices and instruments, although none of them are for instruments alone. We know of the existence of 16 oratories by Gònima, but none are conserved in the Girona archives. The National Library of Catalonia conserves the texts to six of these oratories in small leaflet form, but has only one score of the 16 oratories, of which no leaflet has reached us. It is this oratory that we present in this recording, the first of a Catalan oratory. Since the leaflet to this oratory has not been conserved, we know neither the date nor the occasion for which it was written. Neither do we know the author's name, nor the place where it was interpreted. All the evidence, however, points to the church of the Congregation of the Virgin of Grief in Girona, inaugurated in 1743, as the place of the first performance. This can be deduced from verse 28. It is this verse that allows us to situate the oratory in the context of the Servitas spiritual exercises, which the said congregation carried out on Good Friday in Girona. These exercises were accompanied by music with pious texts. The action of the play, in short, is situated on Mount Calvary where Jesus is nailed to the cross and talking to his Mother, who is accompanied by two anonymous characters, that we have arbitrarily named Personaje I and Personaje II according to the model of other oratories by Gònima. They are rhetorical characters, without historical or literary references that could identify them. They are used by the author as a means of expression of the feelings that he wishes to highlight. The choir, also present in the play, represents the feelings of the congregation attending the act. The author spares himself the effort of defining the elements that could identify space and time in the play, his aim being to arouse feelings of pity in the congregation that are faced with the drama of the Mother who sees her Son nailed to the cross. Here lies the core of the oratory: the creating of empathy between the members of the congregation and the pain of Jesus and Mary so that the former become convinced that their own pain can mystically alleviate the grief of Christ Crucified and his Mother. This way of thinking is found in the Italian baroque and was spread in the city, probably by the Servitas. The metrics of the text deserve special attention: although the verses -all in Spanish as was customary in those times - may seem at first sight to be of free structure, they are in fact all highly elaborate with varied forms in which we find classical Spanish metrics as well as the Italian ones in vogue at that time. This perfection in the metrics, as well as in the rhyme and the music, all stem from the same person. Besides this formal precision, the text also contains references to nature typical of that time and which are elaborated with their corresponding musical effects. Thus, in number 16 we find an earthquake, there is a brief pastoral scene in number 23 and a storm in 25. The high musical quality of this oratory is really surprising: Gònima moves on from the baroque complications of his predecessors - the counterpoint- and gives the oratory a most elaborate structure, with a refined balance between its parts, and also with a subtle alternation of rhythms and voices -solos, duets, choirs. Not less precise is the orchestration in which string and wind instruments alternate and mix in an orderly way. Moreover, there is no stridency in his melodies, which are most elegant. In the clear and distinguished harmony, certain resources obviously from central Europe and Italy, are used. The local musicians were up to date in european musical trends. Following a custom of the times, also common in opera, Mary's voice could be masculine. With this level of perfectionism it is not surprising that the maestro's production was relatively low in spite of serving almost 40 years in the cathedral.